From Victoria River we travelled over the state border to Western Australia. I got to know the hospitality and generosity of some people in the town called Kununurra, when some heavy-weight told me to leave, "otherwise I'll call the police". True! True! Read it down here. We departed the campsite at the Victoria River Roadhouse at the first rays of sunlight. That meant we packed our bags loaded again, got the swags and tents on top of the truck and had a simple bread or cereal breakfast. Today I was going to leave the Northern Territory and the Travelabout Adventure-truck was going to drive me into Western Australia (WA), the biggest state of the continent and "the best state of them all," according to Perth-born tour operator Dave. One third of WA is The Kimberley, the top end of the state and this mountainous corner occupies just some 421.000 square kilometres. We were going to cross it all the coming week! The area was named like that in the 1880's when some Mr. Kimberley was secretary of the British colonies at that time. Its main industry is cattle. And of course tourism. Dave is in one way a funny guy. I think he is related to Goofy, he laughs the same way and he is sometimes as comical too. In the biggest town of north-WA Dave drops everybody off. 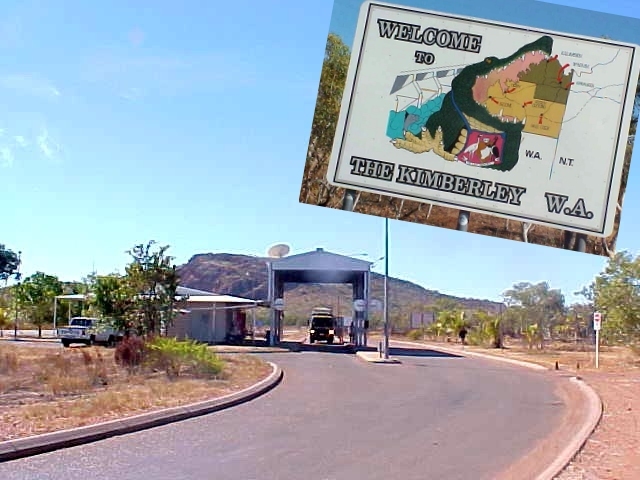 Kununurra, an Aboriginal name, is a small wide-spread city, right next to the state border. We are all told that we can do some groceries at the shopping centre here, as Dave has to do some shopping for our coming 10 days (due to the quarantine check he as to buy our next meal ingredients in Kununurra). I can't do any shopping because I don't travel with money. I don't have any budget and have to rely on coffee in the morning and evening and the rest of the day I refill my water bottle all the time. But I discovered an Internet Shop at the Kununurra shopping centre. At some reception desk I explained my story about my website and how I travel around the world without any money. I friendly asked if there was a change if I could check my email on one of their unused computers. On technical looking guy walking around there said he had seen me on TV a few months ago and they let me use their connection to check my mailbox. There really is nothing to do in Kununurra, so that is why I simply got online. After only two minutes a heavy weight lady walks in and she certainly looked like she was running the business here. She walked up to me and asked me about my website and if I had some ID with me. "Something that says you are commissioned with that Letmestayforaday.com stuff" she says. I said no, because my passport was in my backpack and I had not much with me next to my digital camera. I also explained to her that letmestayforaday.com was my own website and she could easily visit it and see what I do on it. It has over 350 reports and stores over 5,000 photographs, I told her. She said: "If you can't show me anything in real, I don't believe you. Anybody can say you write for some website and ask for free internet." I was stunned. With an open mouth I just sat there, looking at her. We are surrounded by Internet computers and I could just type in my URL and show her my photo on my website. That is me. Don't I look the same or something? "I want you to leave this premises, we don't like freeloaders around here." And that was because I could not identify myself properly. Okay, okay. I didn't want to make this a big deal so gathered my stuff and said thank you to the guy behind the reception desk, who first allowed me to use the Internet, and walked out of the office. "Hey mate," I heard somebody yell at me. "Come here." And I walked back inside, curious to find out if they had probably changed their minds. "That is one dollar for your two minutes please," the guy said. "I don't carry any money with me, it is like I explained in the first place." But there was the heavy-weight lady again, coming around the corner from her office booth. "If you don't have any money, we don't have any money," she said. "We allowed you to use a computer for free, but if you can't identify yourself appropriately, you'll have to pay like anybody else. You know, anybody could walk in here and say that they write for the Lonely Planet." Startled again. I was. What? Was going on here? Which part of I-don't-have-any-single-cent-in-my-pockets didn't they understand? "If you don�t leave now, I'll call the police." She said and I decided to silently walk away again. What a contradictive place this is. I behaved like I have seen too many Australian Aboriginal do it (laying in the grass doing totally nothing) until I found Dave back at the truck with a cart full of groceries. I helped them load it all in the trailer and told him my latest adventure. "Oh yes, that is very Western Australia," he said, "that's just how the people are." Hopefully I meet some more faithful and hospitable people while I am in Western Australia, though! 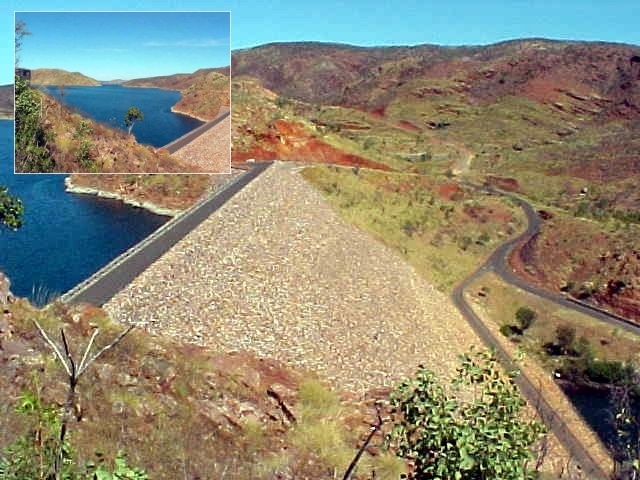 In the afternoon we drove up to a lookout point in Kununurra where I saw how widely spread this area is and how a big dam is keeping this area fertile, otherwise there would be even less than nothing to do in Kununurra! We set up our camp at the Caravan Park of Kununarra, where some three hundred people thought about exactly the same. I started to get into the routine of this tour and we got everything of the truck, set up our tents and prepared tonight's dinner on the gas stove. Whenever I try to make a few notes I am asked what I am writing or talks are born on how many people still write diaries and I hear the ongoing story about one of the passengers that he can't really be without his computer in the UK. He will maybe buy a Nokia Communicator on the road, so that can keep him occupied, he says. It only disturbs me with my thought that I want to write down. Even when I sit in the corner, almost behind my tent, just close enough to a light to see my writing, somebody has to come up and be friendly and sociable. Maybe I miss a moment on my on on this tour. The people I am with all day are the people I am with all day. Only a few minutes per day I need some time for my own mind� please�"